Since the summer we have slowly been redecorating each of the rooms in our house. Last week? We finished! In the New Year I will be sharing some of the other rooms, but as the Christmas decorations are up I thought I would show you what we have done in my favourite room, the living room. We have painted a feature wall taupe and have accessorised throughout with white bits and pieces. Above are some photo shelves from Ikea and I plan to swap whats on them throughout the year. When I visited Liverpool I brought the above light box from a shop there. We currently keep it on the floor and pop in different sayings for different events. The mirror was handmade online and the thick wood matches both my coffee table and TV stand. I've popped on it some Matalan festive bunting which I brought this year. We opted for a fake tree due to a tricksome dog and I opted for a metallic theme, well with the odd homemade lollipop stick decoration made by my toddler! We were going to get new carpet in the living room but as kids make SO MUCH MESS we stuck with the wooden floor and we brought this super thick rug from Ikea. It was really reasonable so we can get a new one in the summer when this inevitably gets squash spilt on it. We have a lovely 'feature' (i.e. a bit fancy) chair in the living room with a comedy pies pillow from Asda but hopefully in 2016 we will be able to splash out on a new sofa. 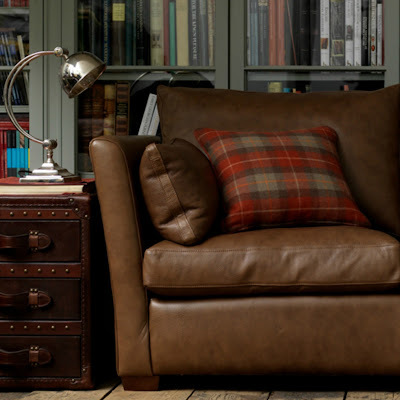 I really love the leather one above from Multiyork Sofas and Interiors. It looks amazing with the wooden floors and I think would sit well in our new colour scheme. Come back in 2016 to see a few more room tours of the brummymummy abode! Looks lovely. I think I have the same snowflake tree decorations. Can't wait to see your room tours!